A friend of mine asked me to name a sushi restaurant in the Coquitlam or Port Moody area that the both of us could visit on a Sunday evening. Little did I know how difficult this could turn out to be. Fuji? Closed. Namoo? Closed. Kaya? Closed. Hanamori? Closed. 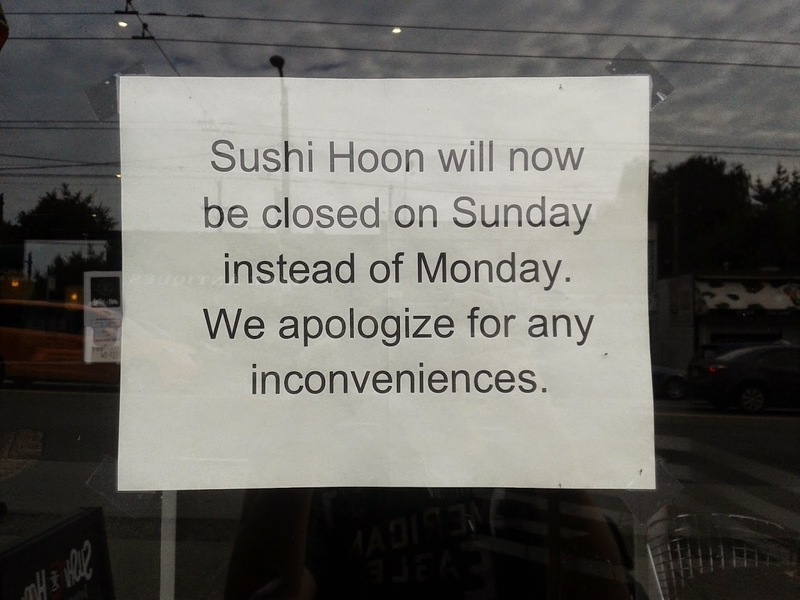 Sushi Town Coquitlam? Nope, don't want to go there for a while. Seriously?! What the chocolatey fudge! I thought Sundays were a popular choice to have a family day and go out to restaurants? Nope, I guess not, or at least not in Coquitlam. Since Sushi & was one of the only decent and available choices close by, that was where we ended up going. In addition, our original party of 2 somehow turned into a party of 6, but hey, the more the merrier. 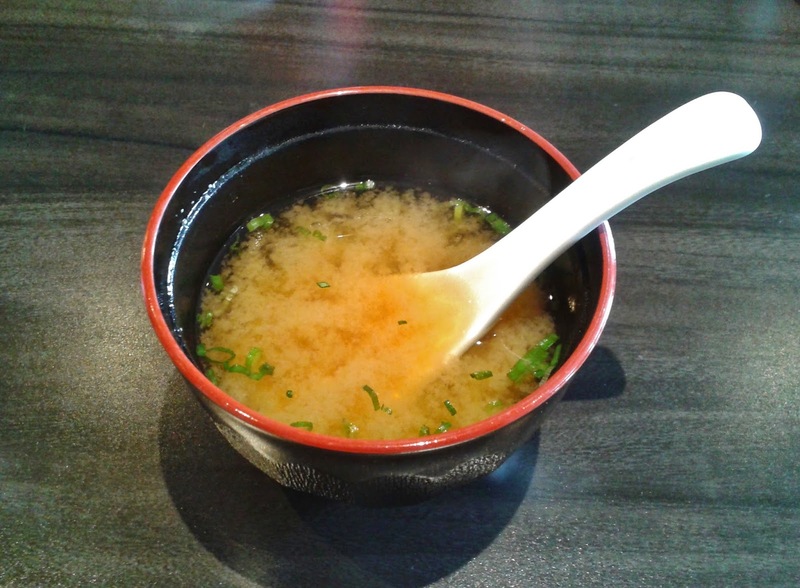 I visited Sushi & (pronounced "Sushi And" - I confirmed this with the staff) two weeks after it first opened, and it was very quiet, but I received very friendly service and decent food, so I returned ... again ... and again. This time, I was quite surprised to see that this Korean-run restaurant had turned into a busy one (though this could have been because the rest of the city was closed). There were four servers, lots of chatter, a shrieking baby who gave me two heart attacks (I'm sorry), and overall, a mostly full house. My group shared most of the sharable items, and I'll detail everything I tried below. The Red Roll consisted of cucumber, scallop and spicy tuna. This was quite a decent version of the Red Roll with scallop and tuna that melted in my mouth. 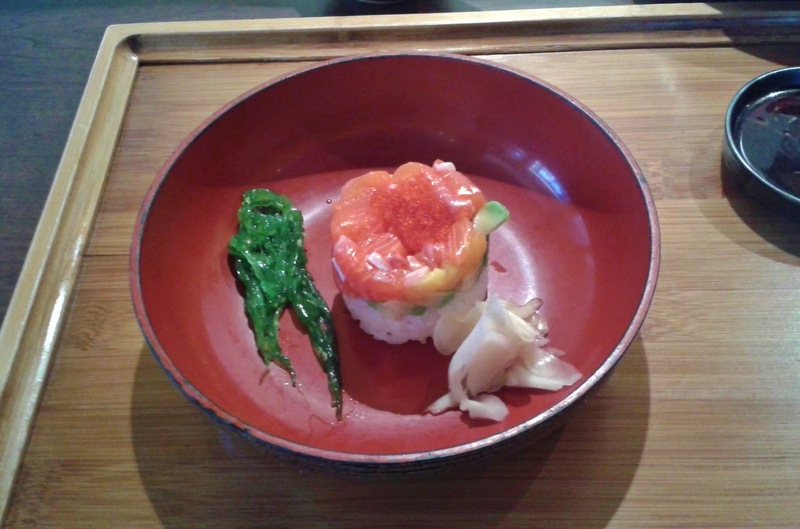 The masago accented the flavour of the scallop. The roll was moderately spicy and for some reason, the spicy sauce had a rather salty aftertaste. 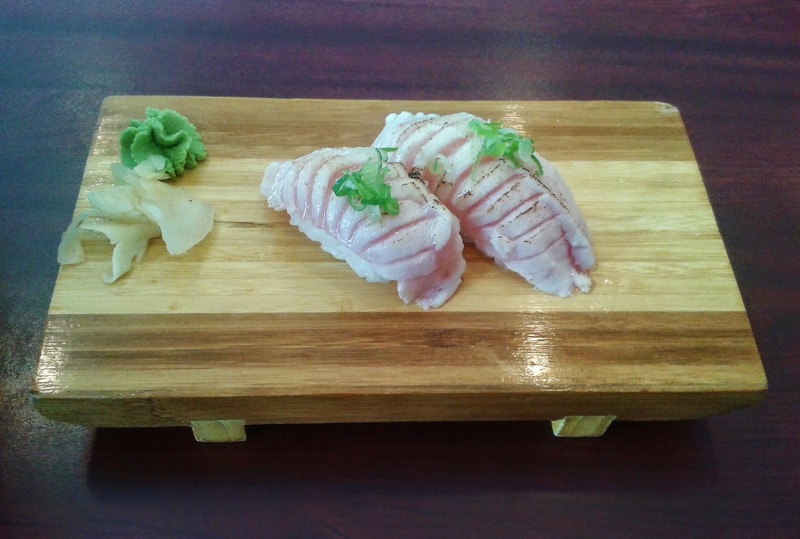 The Negihama Roll was a hosomaki ("thin roll") with hamachi toro (yellowtail belly) and green onion. 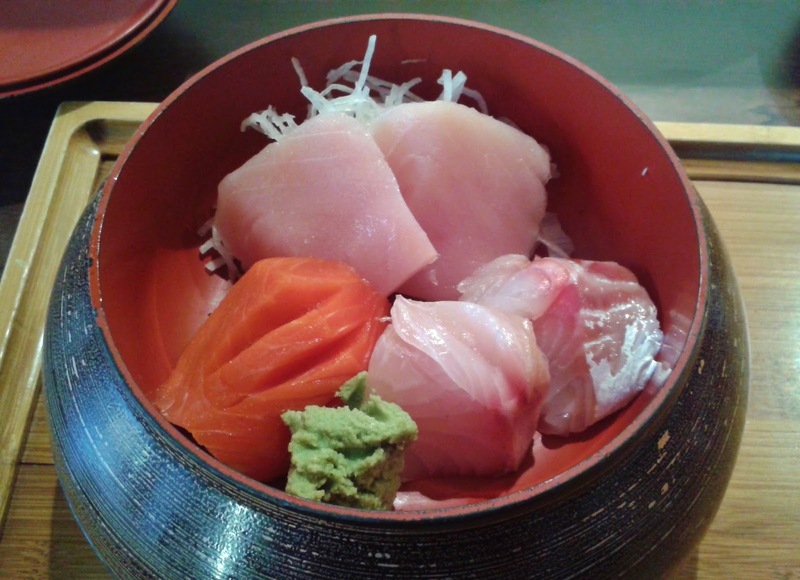 The hamachi toro was fresh, but not a prominent feature inside the densely-packed rice. 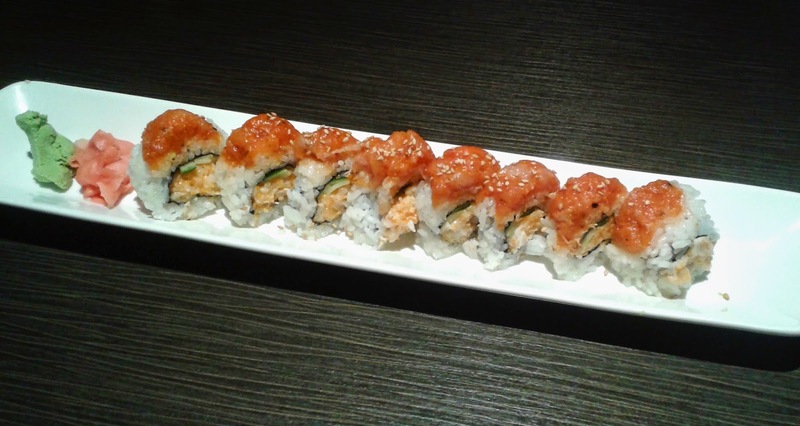 The Crunchy Spicy Salmon Roll came with cucumber, spicy salmon and tempura bits. 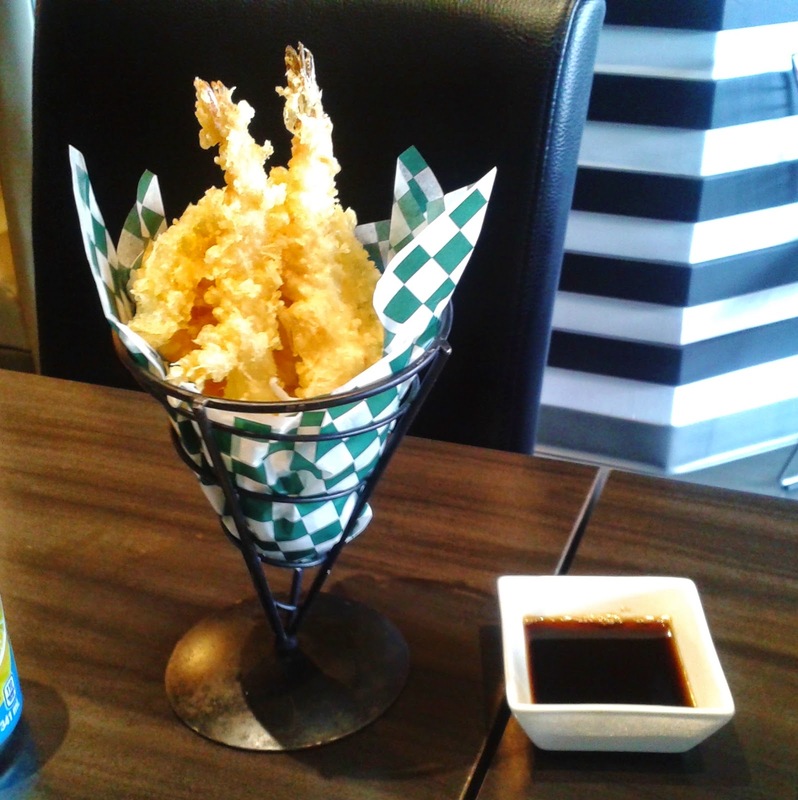 I tend to enjoy crunchy tempura bits if used in moderation, and here, the tempura bits satisfy that criterion. 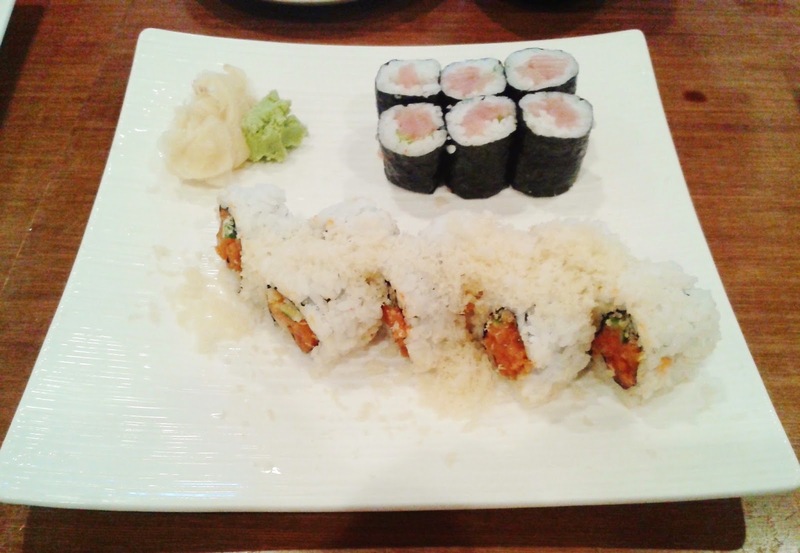 The spicy salmon was equally soft compared to the spicy tuna, but had the same salty aftertaste. 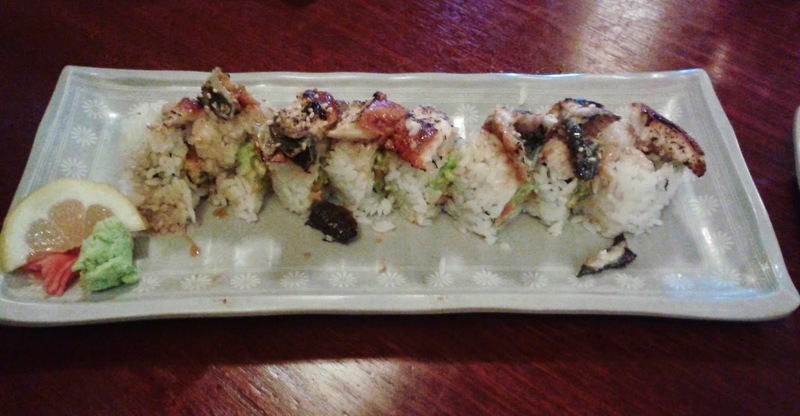 The &'s Roll (formerly the Midnight Sun Roll) consisted of cucumber, avocado, crab meat, unagi, and wild salmon. 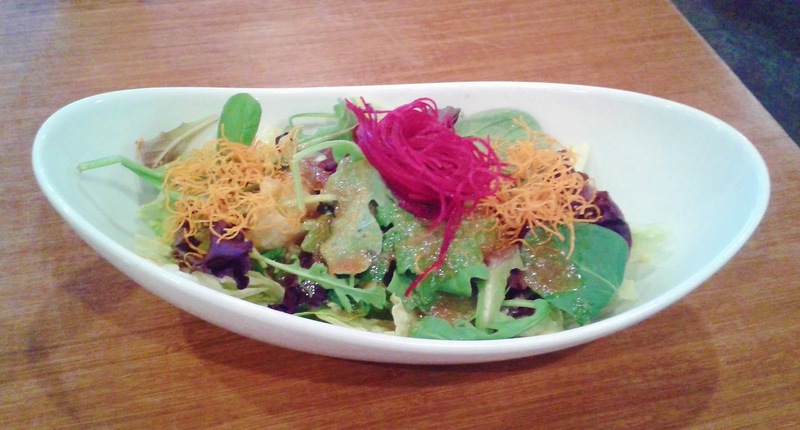 In addition, it is decorated with a wakame salad as the centerpiece. The soft, buttery avocado was a great match to the sweet teriyaki sauce. 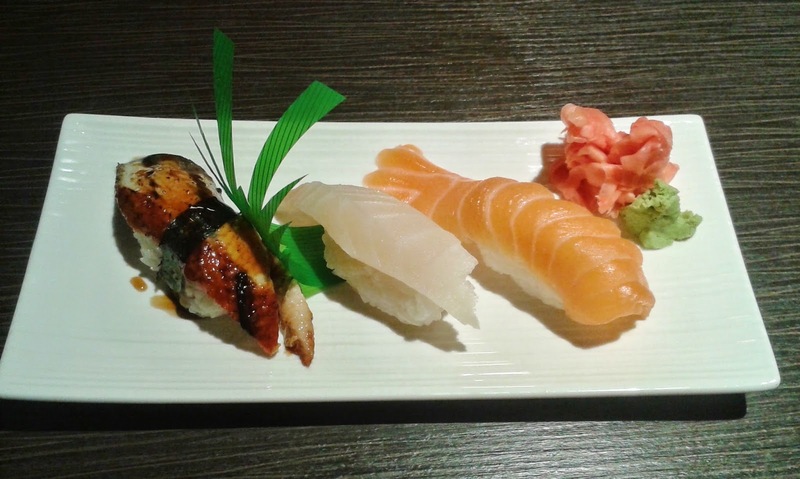 The salmon was fresh, while the unagi was a touch too fatty. This would have been a very decent roll if it didn't constantly make me think, "Why is this mayonnaise so strong?" the whole time I was eating the roll. 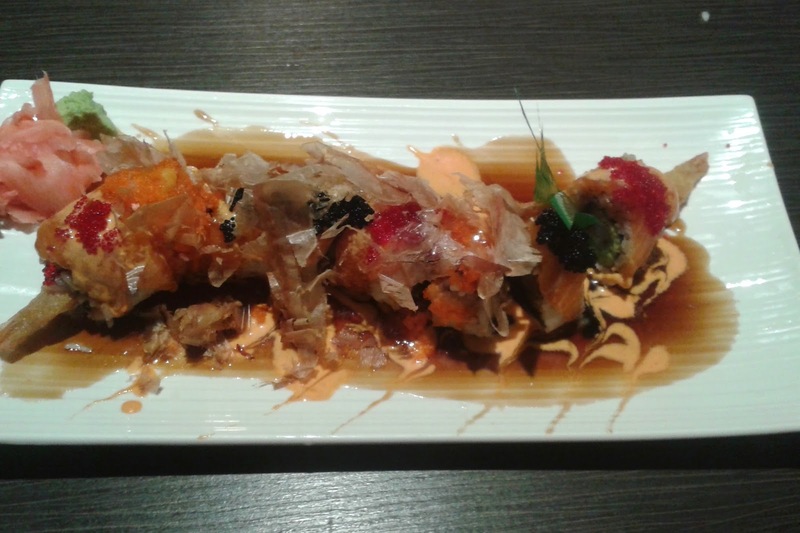 The Red Dragon Roll consisted of prawn tempura, cucumber, avocado, salmon, masago and tobiko, along with teriyaki sauce and mayonnaise. 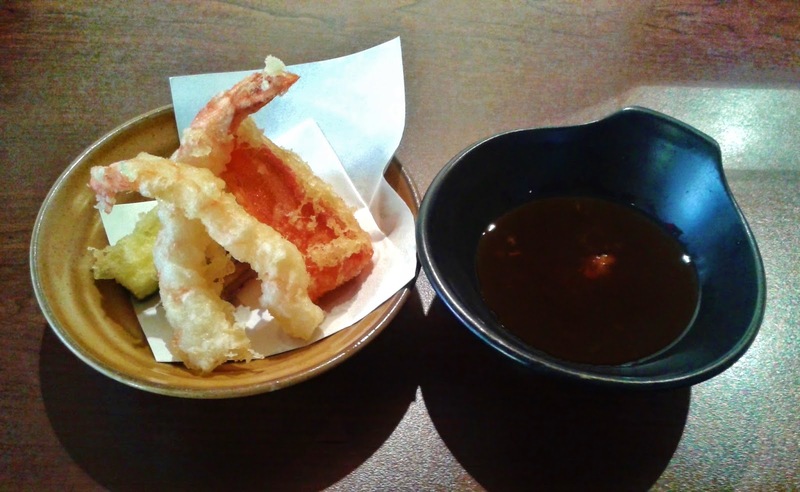 The batter on the prawn tempura was slightly crunchy without being hard, while the prawn provided adequate flavour. The salmon had a desirable, marbly texture and overall, the roll was served warm due to the freshly fried tempura (which is a plus). 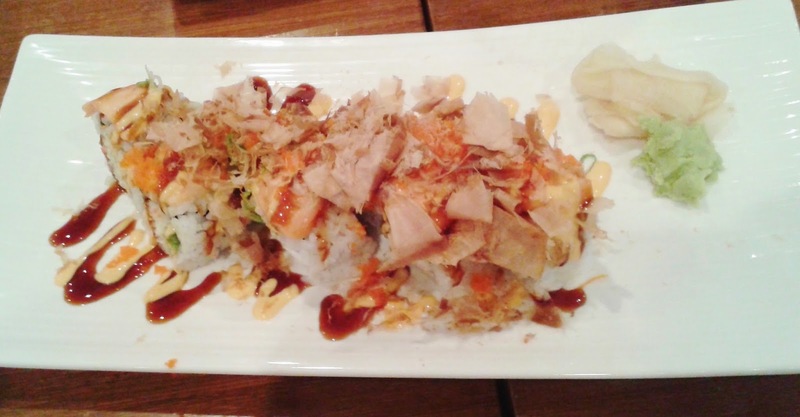 The Awesome Roll is a California roll topped with salmon, masago, bonito flakes, teriyaki sauce and mayonnaise. The salmon was a bit too cooked and the bonito was slightly hard, but the California roll base was decent. The roll was served neither warm nor cold, and is similar to Sushi Town's version. 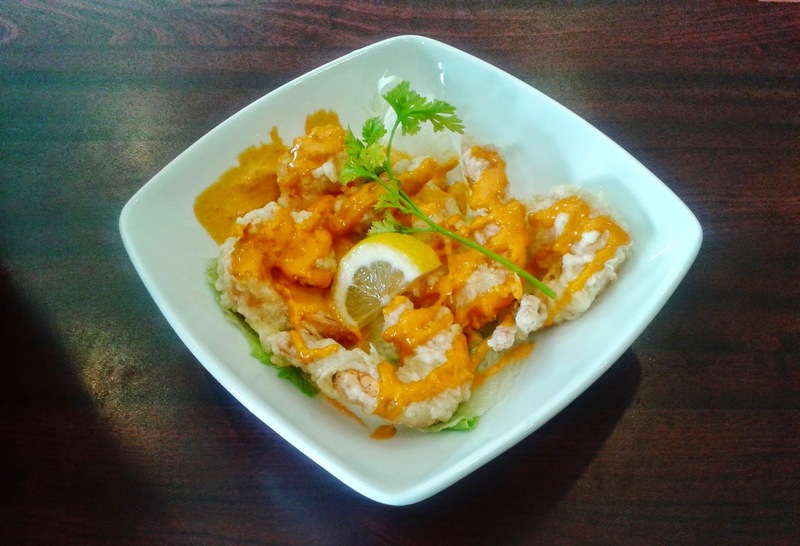 The Ebi Mayo came with 6 battered prawns and was served hot. The prawn was soft, but they were quite heavy on the batter, which wasn't spread out very evenly. There was also quite a bit of mayonnaise and it was quite greasy. I would have preferred half the amount of mayonnaise or even better, having the mayonnaise served on the side. I did like the seasoning on the top, which prevented the Ebi Mayo from tasting all buttery and creamy. 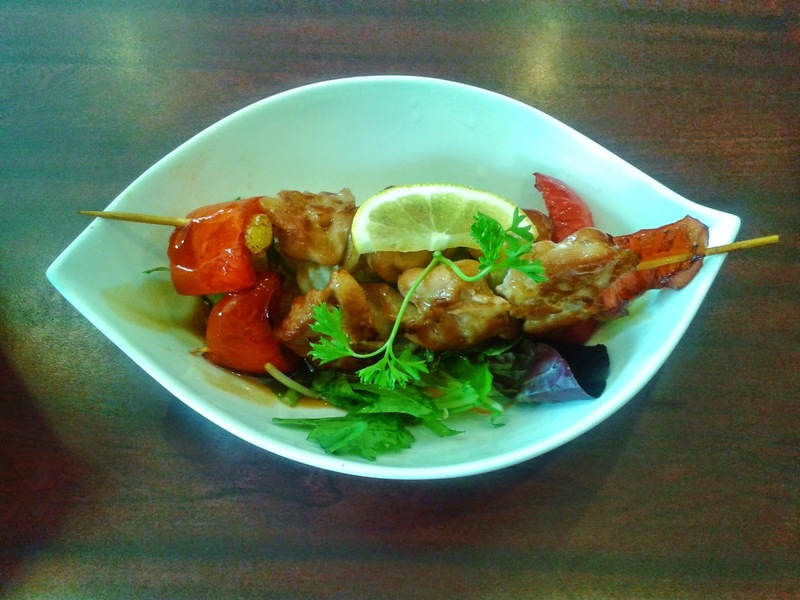 The Yakitori came with two medium-sized chicken skewers which also contained peppers and onions. The Yakitori was hot when it came and wasn't over-grilled. The chicken was mostly tender except for a few tougher parts where no sauce was applied. However, the teriyaki sauce was visibly oily ... do they really need that much oil for Yakitori? After everyone else was finished eating, I still decided to order more food! What ensued among the rest of my table was a rock-paper-scissors loser-eats-wasabi match ... while I focused on sampling the nigiri. 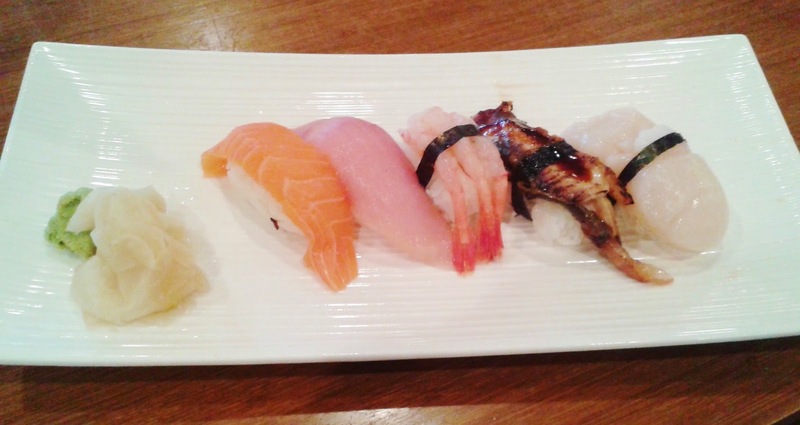 The nigiri were all served with soft sushi rice, which had a mild flavour to it. There was some confusion that occurred as not all the servers knew what "hotategai" was ... apparently I should have said "hotate" because that's how it was listed in the menu. After I explained the error, they switched the hokkigai they accidentally gave me with the hotate which I wanted. Eating from right to left, I started with the Hotate Nigiri which slightly lacked flavour, but was fresh, jelly-like and had the same sweet aftertaste as geoduck. The Unagi Nigiri was grilled for too long, had a 1 cm bone in it and was rather fatty (I should've picked up the cue from the &'s Roll, but I am stubborn and never learn). The Amaebi Nigiri was soft and sweet, but there was a disproportionately large amount of rice under the shrimp. 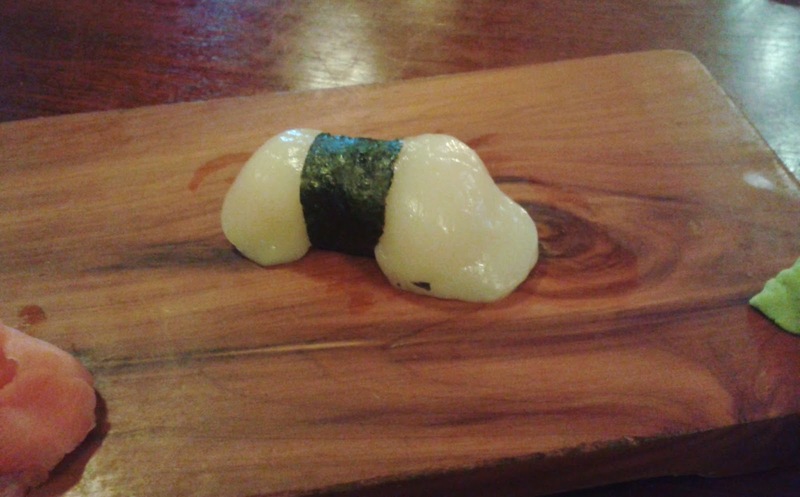 The Tuna Nigiri was very soft and melted in my mouth in a desirable way, with a minimal metallic taste. The Tuna Nigiri had the best fish-to-rice ratio out of all the nigiri. The Salmon Nigiri was a bit tough, but it had a smooth texture and tasted fresh. There was also an unidentified mysterious object (UMO) stuck to the rice of my Salmon Nigiri (it's the little dark red speck in the photo). In terms of service, there wasn't much to complain about - we were provided with both iced water and tea which were refilled in a timely manner, and servers came promptly when I waved for them or made eye contact. The food wasn't necessarily light, but there wasn't a single item we ordered that tasted bad. 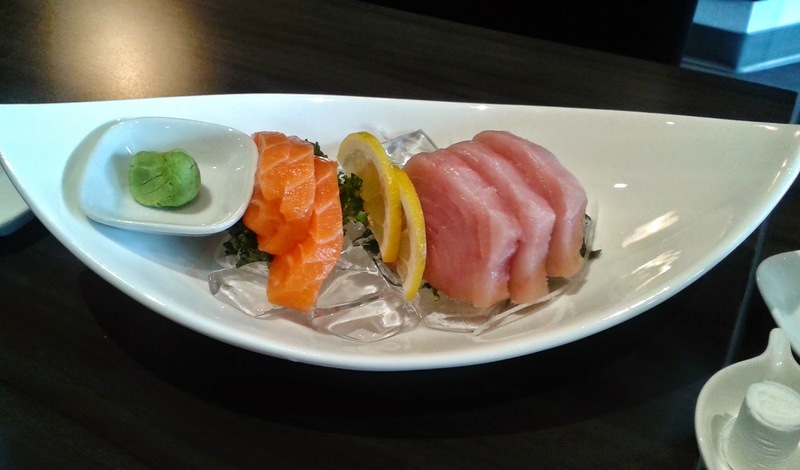 If you are looking for affordable and decent sushi around Lougheed Station, Sushi & is most likely your best bet, especially on a Sunday. Hot, humid, and overcast describes the type of weather I dread, while running out of hot chocolate powder describes the type of morning I dread. Since I live in an area with sparse public transit, I quickly drank some coconut juice and shoved 3 crackers in my mouth prior to leaving so that I could catch the next bus. Three hours later, I had purchased some of my textbooks from the SFU bookstore and arrived at Lynn Valley, prepared to have a colossal lunch after a colossal amount of time sitting in buses. 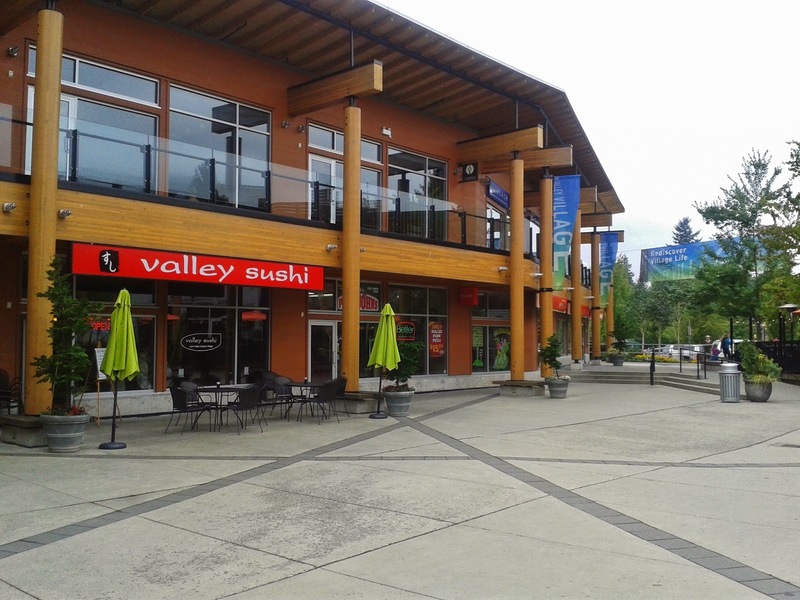 Lynn Valley is a beautiful and fast-growing area in North Vancouver, and the Lynn Valley Shopping Center looked almost as busy as Metrotown did when I was a kid. It looked quite clean inside too, though the decor was quite simple. I opened the menu and noticed an item called "Salmon Candy." I love trying new things, but I had no idea what that was, so I read the description, which said "Candied salmon with chef's special sauce." Okay, very helpful ... I tried to mentally picture that and I thought of salmon covered in chocolate sauce, just like candied apples. However, chocolate-covered salmon just didn't seem right to me, so I asked the waitress about the Salmon Candy, and to my surprise, she knew as much about the Salmon Candy as I did. She came back after consulting the chef and told me in accurate detail what it was. I ordered it, and in less than ten minutes, all of my food arrived. The Seared Toro Nigiri came with loose sushi rice that held together well. It had a light, barbequed flavour and was very lightly dressed. I wished they used a little more seasoning, but with the light seasoning, you can taste the unmodified flavour of toro sashimi. 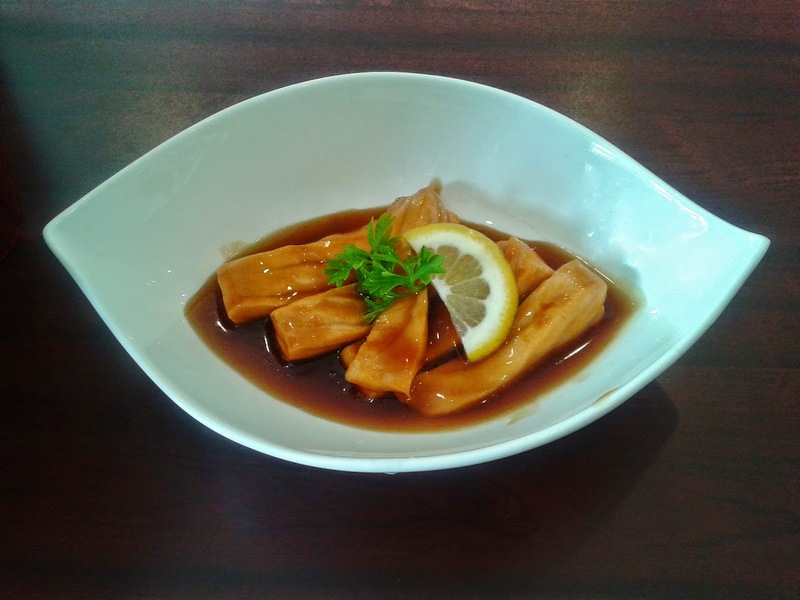 Debunking the myth of the mysterious Salmon Candy ... which is actually a dish containing slices of salmon sashimi, cooked with teriyaki sauce. 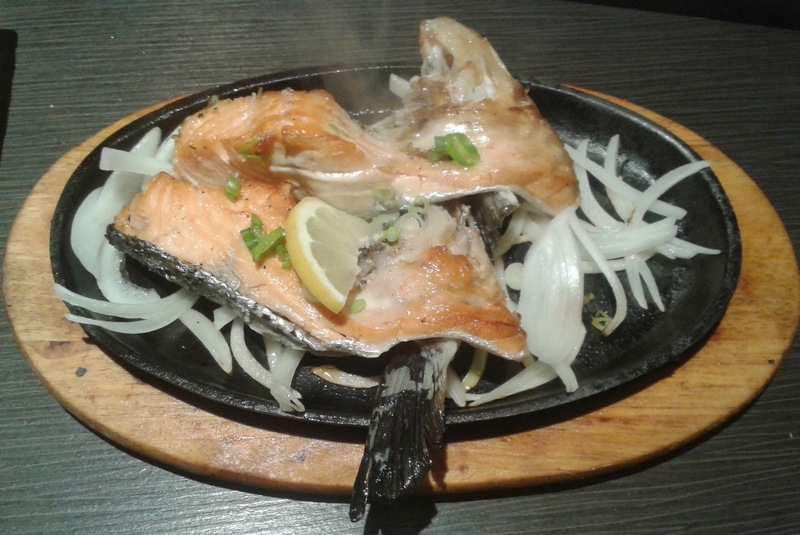 The salmon wasn't fully cooked, so it was much softer than the salmon served in a typical Salmon Teriyaki, but with the same savoury and mildly sweet flavour. The consistency of the sauce was slightly too thick, but overall, I am glad to have ordered this dish. 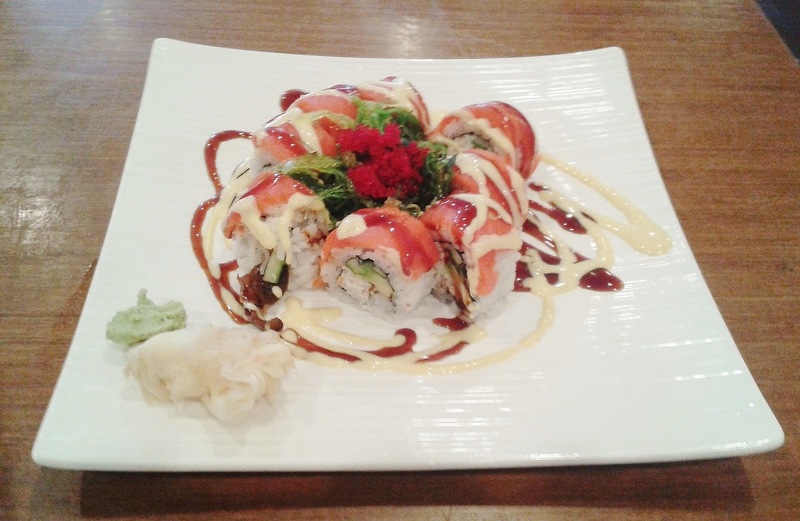 The Red Dragon Roll consisted of unagi, avocado, masago, avocado, cucumber and crab meat. I bet if they also mentioned the yam fries in the menu, the roll would sell better. The yam fries were slightly crunchy and softened from the moisture of the masago and the sauces, which I actually felt was a plus. Although the unagi was a bit dry and the crab meat lacked flavour, the freshness of the avocado got through to me and was one of the highlights of the roll. The Yakitori came with two large chicken skewers along with red peppers, onions, leeks, and a salad underneath, all for just $4.00! The red peppers, onions and leeks were all successfully grilled and were better than the chicken, which was a bit tough. They could use a few more minutes to allow the teriyaki sauce to seep into the chicken, which would make it more tasty. Well, it was time to finish the two remaining prawns and an extra glass of water. Service was attentive and friendly throughout my meal, and the occasional funny responses (one server accidentally said that all the special rolls were like California rolls) brightened up my visit. Including tax and tip, I paid a total of $36 for a lunch that mostly exceeded my expectations. The bill made me question my ordering strategies, and I admit - the struggle is real, but the sushi is good. My family and I were looking for a place in Coquitlam to have a bit of Japanese food (not a full dinner as we weren't exactly hungry) and stopped at Akari Japanese Restaurant only to find out that it was permanently closed. 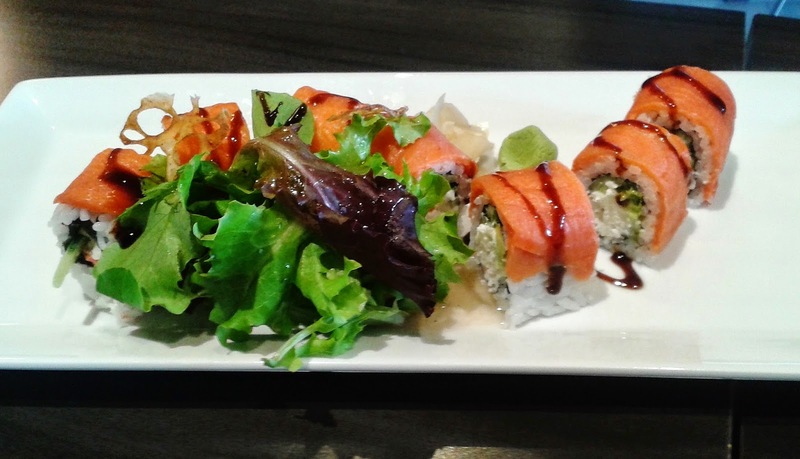 We considered our choices around the area and opted for Sushi Oyama to have a quick meal. The beautiful decor (which includes a glass waterfall near the entrance), the huge dining area (with spacious seating throughout) and the warm attitude from the servers are all attractive features as you walk into the restaurant. Even though we walked in at 8:30 p.m. on a Monday night, there were still a considerable number of customers enjoying a late dinner at Sushi Oyama. After about 10 minutes, my nigiri came followed in quick succession by the Red Roll. I quickly grabbed a piece of the Red Roll before sampling my nigiri. The Red Roll came with chopped scallop, cucumber, spicy tuna and mayonnaise. 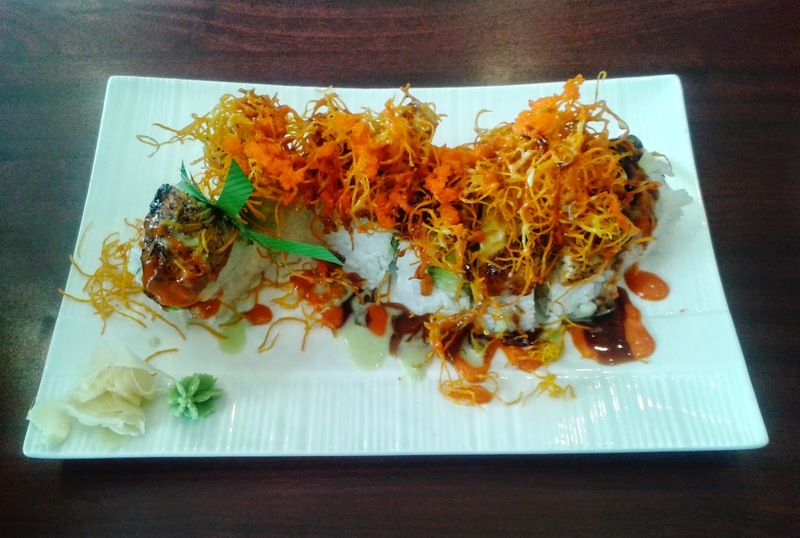 The roll is mildly spicy and the use of masago with the chopped scallop enhanced the flavour of scallop. Both the spicy tuna and chopped scallop exhibited desirable smooth textures, and even though the chopped scallop was chopped up a bit more than usual, I highly enjoyed the soft and easy-to-chew qualities of this roll. 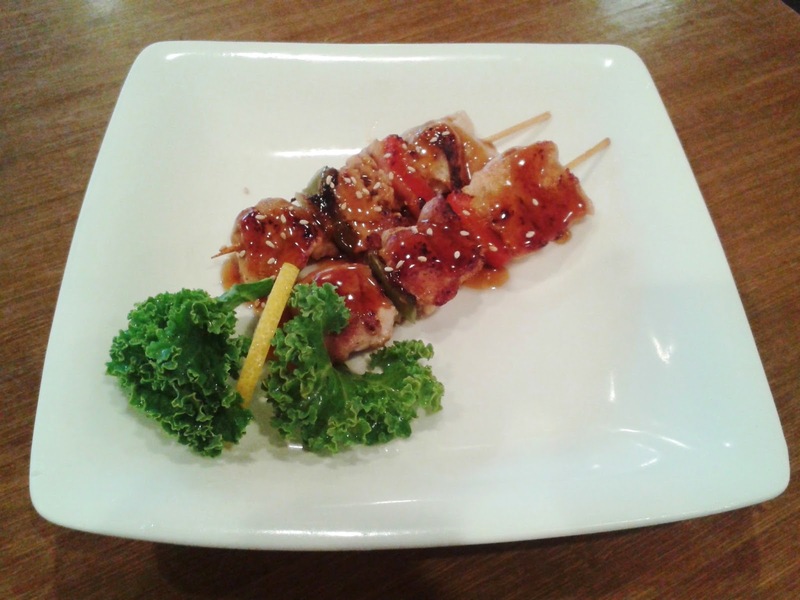 The Unagi was the tastiest of the three and the sweet teriyaki sauce that was added on top made it more savoury. There was a bit too much skin and it was served cooler than expected. Next, the Tai Nigiri was mostly devoid of flavour and had a rough, mashed texture. The heavy density of the rice didn't help, and some of the grains of rice started to fall apart. The Salmon Nigiri had a nice buttery flavour to it and tasted fresh, but was sliced rather thin (even though it was quite long). Again, the denseness of the rice distracted me from enjoying the fish. The Sound Trap Roll consisted of cucumber, avocado, prawn tempura, tuna, tempura bits and mayonnaise. 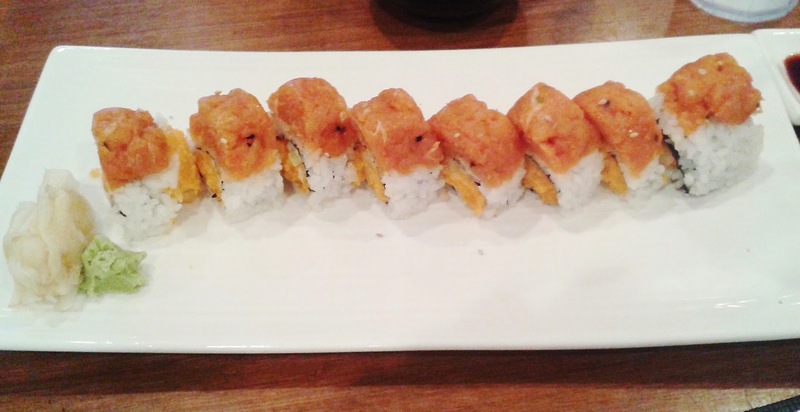 I'm not sure why it was called the Sound Trap Roll, but it tasted quite good. The roll had an overall sweet and creamy taste and the cucumber did not disrupt the softness of the roll. The tuna was lightly seared which added a light, smoky touch to the roll. The herbs gave the roll a slight essence of Caesar salad (in a good way). 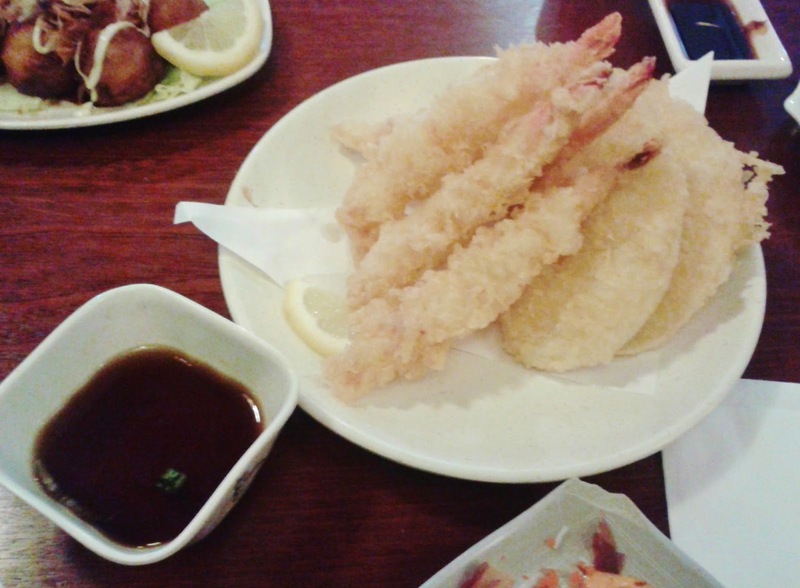 My only issue was the uneven crunchiness of the prawn tempura, with some of the pieces being too crunchy or too hard. 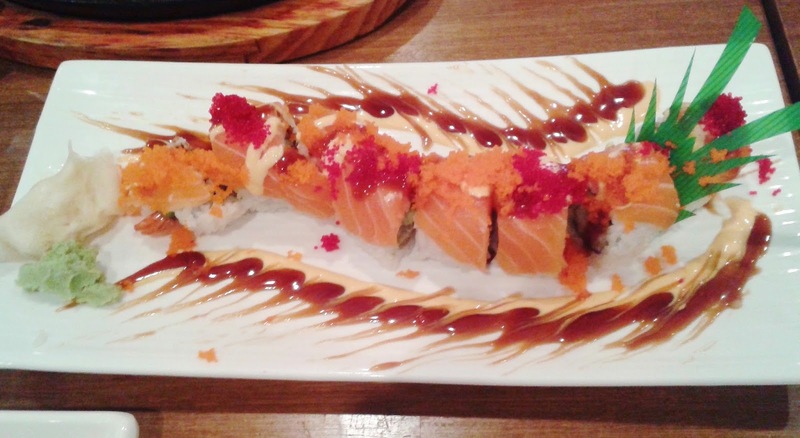 The Red Dragon Roll consisted of salmon, prawn tempura, masago, tobiko, bonito flakes, and mayonnaise. The different colours of the fish roes (masago and tobiko) gave the roll a very colourful appearance. Unfortunately, there was too much sauce and the sauce was too spicy, which sort of overwhelmed the roll. Eating a piece of the roll as a whole (without picking apart the ingredients), all I could notice under the spiciness was the fact that the prawn tempura was fried in overused oil (I know it's the end of the day, but I rate what I'm served). Consistent with the Salmon Nigiri, the salmon on top had the same buttery and fresh taste. Wow, at $4.50, the BBQ Salmon Gama was an unexpected and extraordinarily good deal! As you can see from the photo, we were served a very generous portion. Since it came on a teppanyaki plate, the BBQ Salmon Gama was nice and hot and you can even see some of the sizzling in the photo! The Salmon Gama was juicy and parts of it were brimming with fish oils. They were conservative with the amount of herbs and sauces so this dish has a rather mild flavour overall, allowing you to taste the natural flavour of the salmon without too many garnishes. Other than some of the nigiri, the food was quite decent and well presented. The servers had a friendly attitude, but I wish there was more service. Sometimes, I had to push the service button on the side of my table more than once to get a server to come. The prices are quite reasonable for the food, and if you come with a large party (10 or 12 people), they have tables dedicated for that purpose. The next time I have a large party dining with me, I will probably take my business here. I remember that in my first year at SFU, finding decent food on or around Burnaby Campus was one of my top priorities besides studying. Pricing of the food was also important to me, so I sampled my way through the food vendors without finding anything that I really liked. Then, I heard about Sushi Town on Hastings, which was only a mere 10 minutes away by bus, and decided to try it. Not only was it less expensive than the food on campus, but it was also much, much better. That led to my persistent sushi cravings and my continuous quest to find better and better sushi by exploring all of Greater Vancouver. 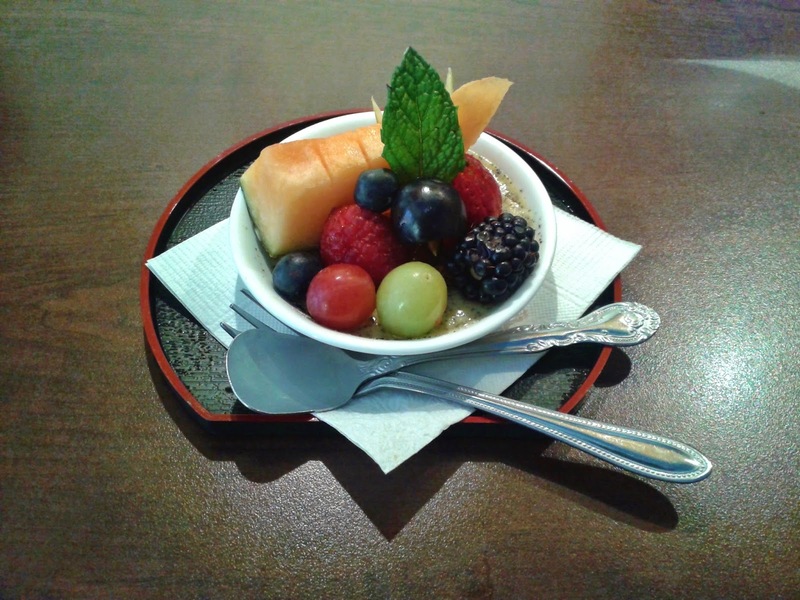 Having regularly visited Sushi Town on Hastings ever since, I went to Sushi Town in Coquitlam after their most recent renovation with a large group of relatives. The decor was much fancier (it was like a cafeteria before) and it looked promising as I walked in. Even though the restaurant was quite busy when we arrived at just before 6 p.m., they could have done a better job of trying to accommodate our party of 12. There was an opportunity to seat us all close together with there being two empty tables at the back and one empty table across a small aisle from those two tables. Instead, the waitress told us that we had to split up into two groups of 6, with each group sitting in a different corner of the restaurant. Alright, that wasn't too much of a deal, and for some reason, we decided to split based on age. I ended up being the oldest person at the "young" table. Sushi Town always manages to serve sashimi at a lightning quick pace (ours came in about 5 minutes, but sometimes it only takes 2 minutes for it to arrive). 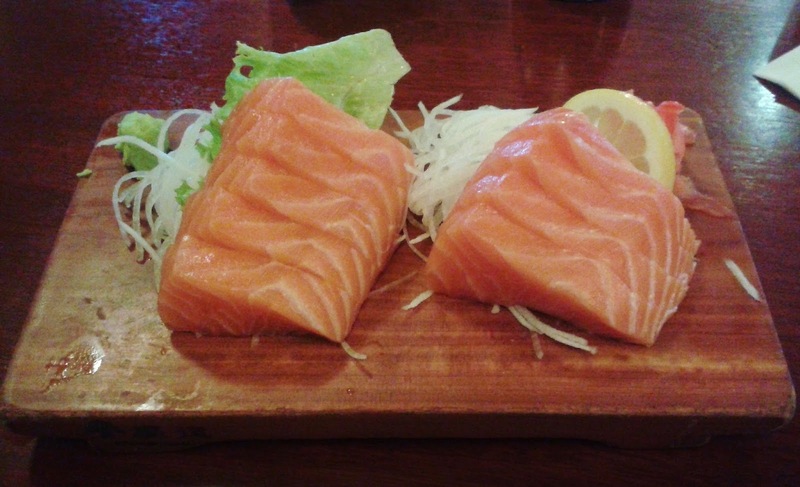 The Salmon Sashimi was very fresh and came with 9 neatly cut pieces, each with a decent size. The sashimi had a desirable smooth texture and was quite tender. The only minor issue was that some of the pieces were stuck together at the ends. 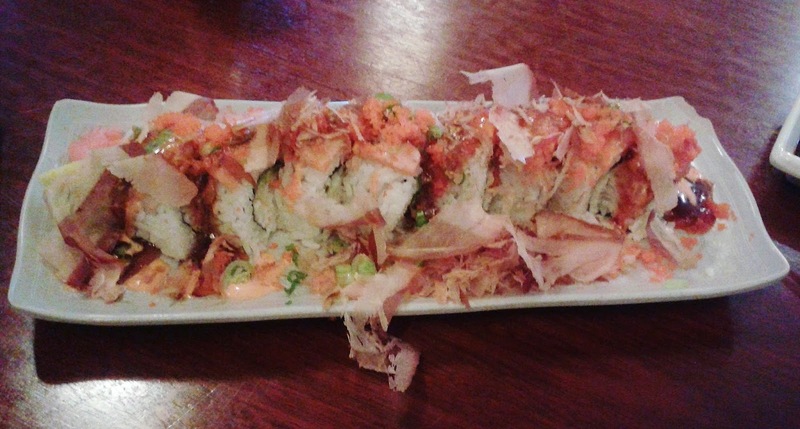 The Awesome Roll came with crab meat, cucumber, avocado, mayonnaise, masago, salmon, green onion, and bonito flakes. This is quite a large roll and for $6.95, it is a good deal. The Awesome Roll was served chilly and was moderately spicy. The crab meat was quite coarse and the sauce was a little heavy, but at least it enhanced the flavour of the roll somewhat. This was inconsistent with the Awesome Rolls I had at both the Hastings and North Vancouver locations - the Awesome Rolls there are usually mildly spicy, served neither chilly nor warm, are soft in texture, have teriyaki sauce that is an excellent match for the bonito flakes and masago, and usually score an A- or a B+. 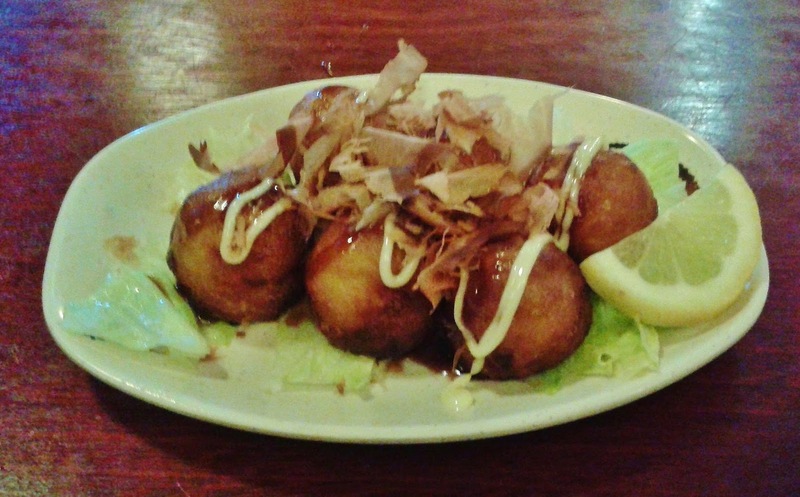 The Tako Yaki had good flavouring to it but was unfortunately a bit burnt at the bottom. I liked the soft flour inside, but I found it odd how the tako was sitting on top of the flour just underneath the crust rather than being encased in the flour. 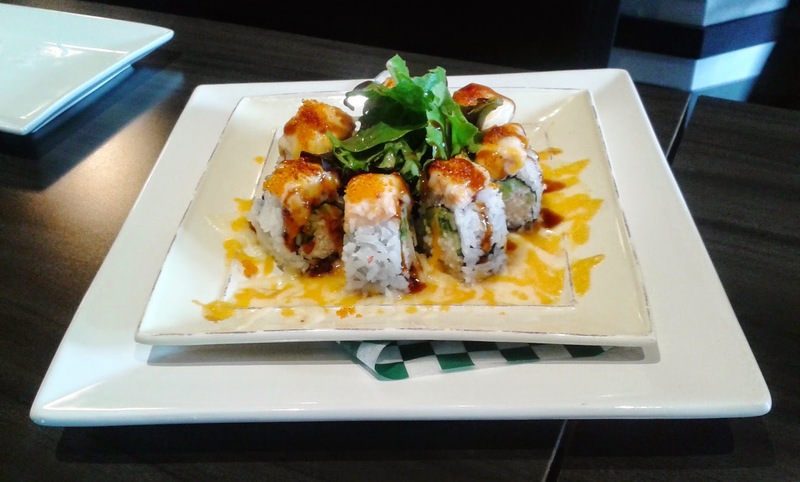 The Dragon Roll consists of avocado, cucumber, tobiko, unagi, and mayonnaise. Other than a slight rotation so that a photo could be taken, this was how the roll was served. The presentation was sloppy enough to warrant a slight deduction. The avocado was sweet and buttery, while the unagi needed to be more rich. The rice was overly chewy and there was a bit too much of it. 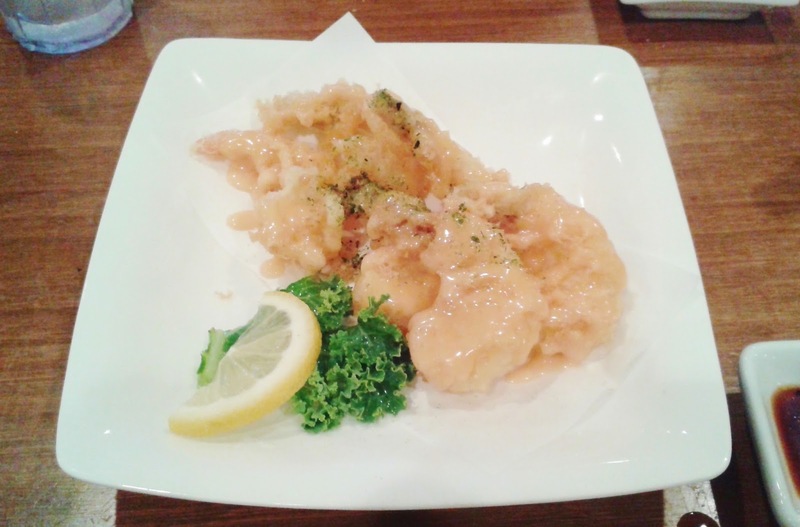 The Prawn & Sweet Potato Tempura came with 4 large pieces each of prawn tempura and yam tempura, all for $7.95. The batter was very heavy and obscured the contents inside. In addition, the oil used to fry the tempura showed signs of overuse. The prawns had a nice, soft bounce to them, while the yam (sweet potato) was adequately sweet but was very thin. Except the salmon sashimi, the quality of the food thus far has been considerably different from what I had at the other Sushi Town locations. Perhaps the chef who prepared the food for our table was less experienced, or perhaps someone was having a bad day? As a small consolation, the BBQ Salmon Gama was quite decent. The spices and pepper sprinklings that garnished the salmon provided light spiciness and savour to the salmon. Some of the parts lacked moisture, but the moisture-laden parts, especially those close to the cartilage, were quite tasty. 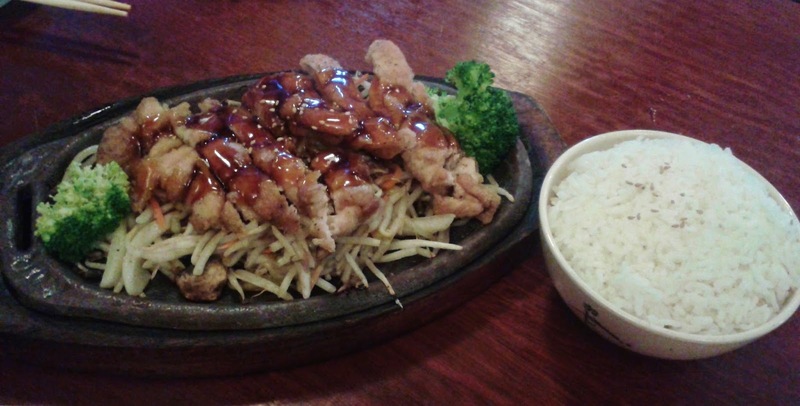 The Chicken Teriyaki came with tender chicken on a bed of vegetables mainly composed of bean sprouts. I liked the teriyaki sauce on top of the chicken, which showed considerable improvement compared to their pre-renovation period. Unfortunately, the entire layer of bean sprouts touching the hot plate had a very charred flavour to them and the rice was quite gummy. Also, the skin on the chicken had a mashed texture instead of a crispy one. 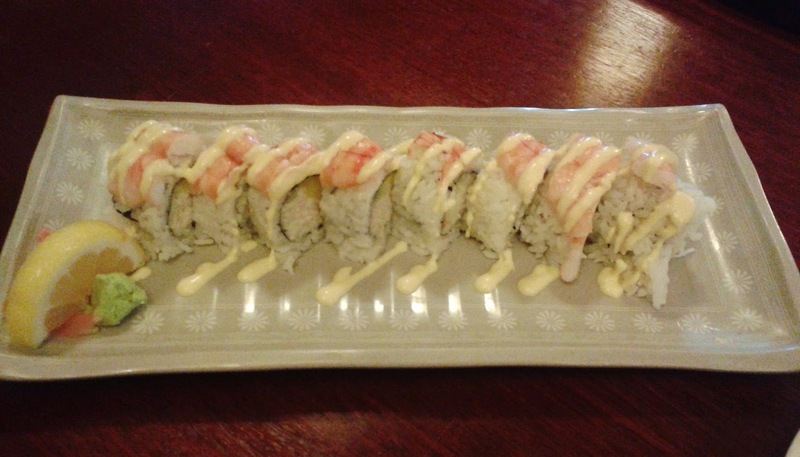 The Mangodise Roll consists of mango, crab meat, mayonnaise, ebi (shrimp) and cucumber. There was an overflow of rice and again, the crab meat was quite coarse and resembled T&T imitation crab meat. The shrimp on top was overly chewy and I wish the mayonnaise was spread more evenly throughout the roll. The Hotategai Nigiri looked much better than it actually was. 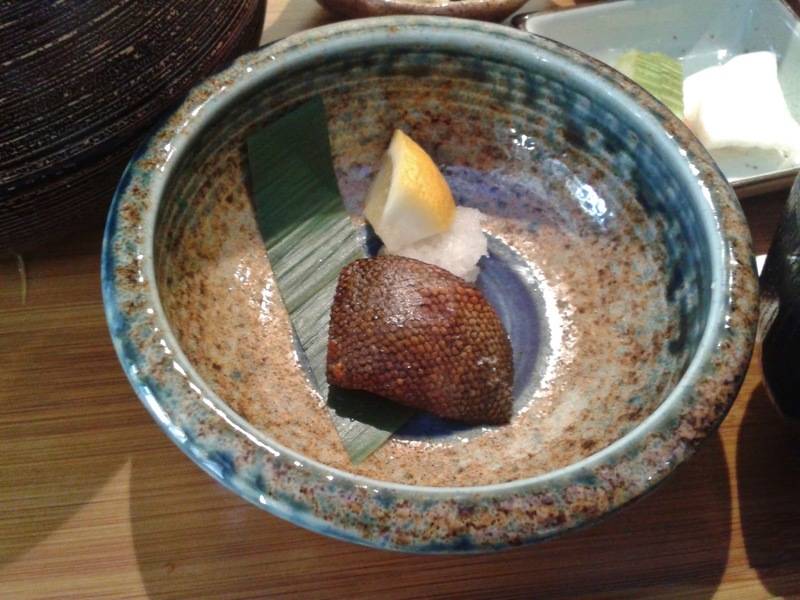 The Hotategai itself was actually quite fresh, but somehow, they managed to make it quite slimy and watery. It also wasn't cut very well, and there were some strands dangling from one end. Worst of all, the wasabi tasted like it had mint toothpaste mixed in. I completely lost my appetite after this one. The fact that such a fresh, beautiful piece of scallop could be messed up so badly almost brought me to tears. This was completely not what I expected of Sushi Town when I stepped into the restaurant. Furthermore, service was sparse and we had to ask several times for tea refills. I went over and asked the other table in my party of 12 to see if they had similar problems. Strangely enough, they remarked that their tea was refilled several times without asking and that their food was decent and presented neatly. Was I receiving discriminatory service and discriminatory food for being young? I hope the difference in quality between the two tables in our large group was unintentional, but in either case, I will still maintain that this visit to Sushi Town was a particularly disappointing one. I happened to be in Richmond trying to find a mini notebook and a mini pen so I could conveniently take notes during my sushi adventures. Let's just say that the mini notebook took 10 minutes to find, while I could not find a mini pen with a clip after searching for 5 hours. During my search, I found mini highlighters, mini permanent markers, and even mini pencils with a clip! Wow, who ever thought it could be so hard to find the right pen? In the midst of my search, I was hungry for lunch so I went to Kiriri Japanese Cuisine & Sushi Bar. 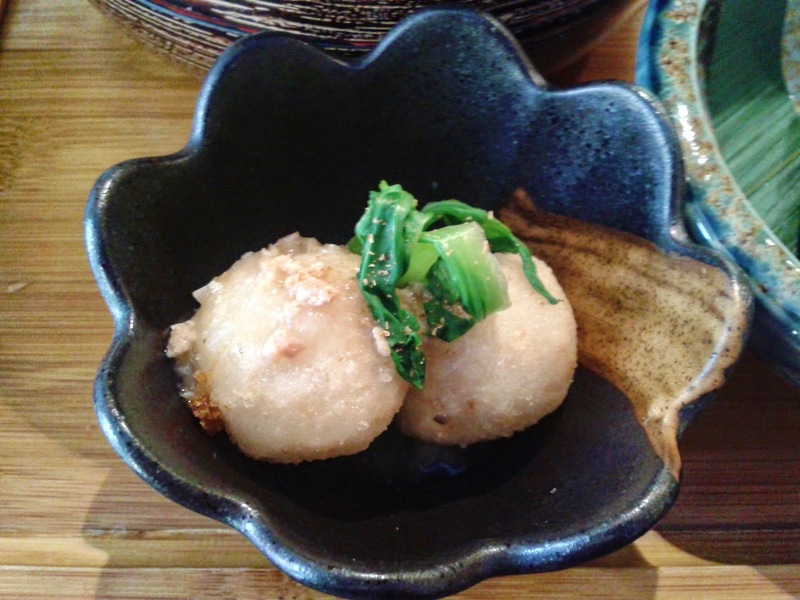 Kiriri is run by Japanese servers and Japanese chefs, and is frequented by both Japanese and Chinese customers. It was funny to hear the diners sitting next to me muttering about how high the prices were, but in my personal opinion, the prices were justified. I ordered the Kaiseki Lunch Set, which takes approximately 20 minutes to prepare, as well as the Starter Tempura, which would help me pass some time as I waited for my lunch set. Kaiseki refers to a multi-course meal which allows the chef to demonstrate his exceptional preparation techniques and showcase his presentation skills using Japanese aesthetics standards. It is like a taste-testing set. The chef who prepares the Kaiseki lunch sets at Kiriri maintained a very focused, concentrated look on his face, rarely smiling or speaking to anyone (unless you attempt to talk to him). 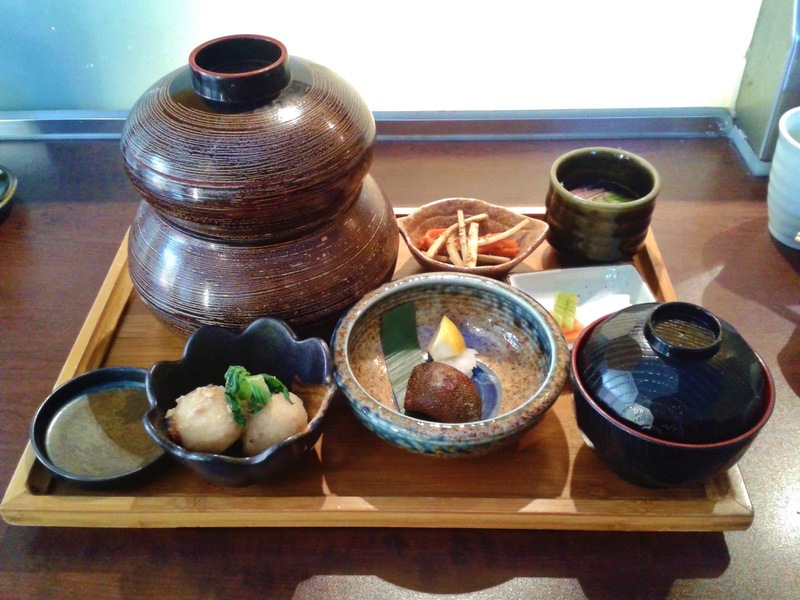 As you can see, the presentation of this Kaiseki lunch set is quite impressive. All of the items pictured below, including the Crème Brûlée, are part of the Kaiseki lunch set. Taro and me typically do not get along, and I always struggle to understand why it is so popular. However, this dish made me re-think my dislike for taro. The ball-shaped pieces of taro were accompanied by a small amount of miso sauce, which allowed the taro to be soft and full of moisture. The thin outside layer was soupy, crispy and delightfully savoury. 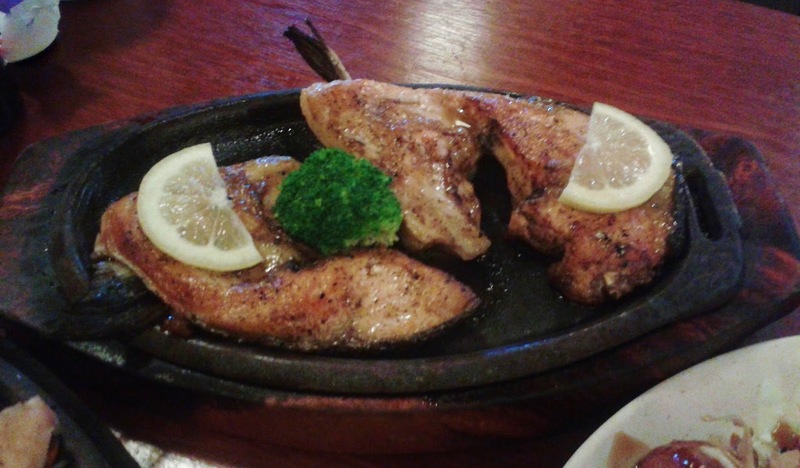 The Kobachi Grilled Fish had a velvety smooth texture and a distinctly sweet flavour. It could be more juicy, but I found it very tasty nonetheless. 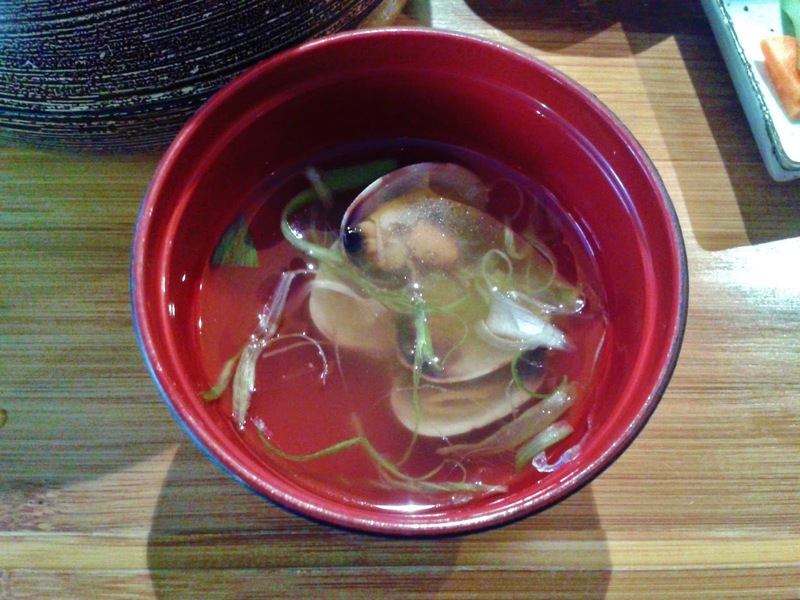 The clear soup came with 2 Manila clams and some green onions. The flavouring of the clams was nicely distributed throughout the soup. The clams themselves were a bit small, lacking in flavour, and noticeably sandy. 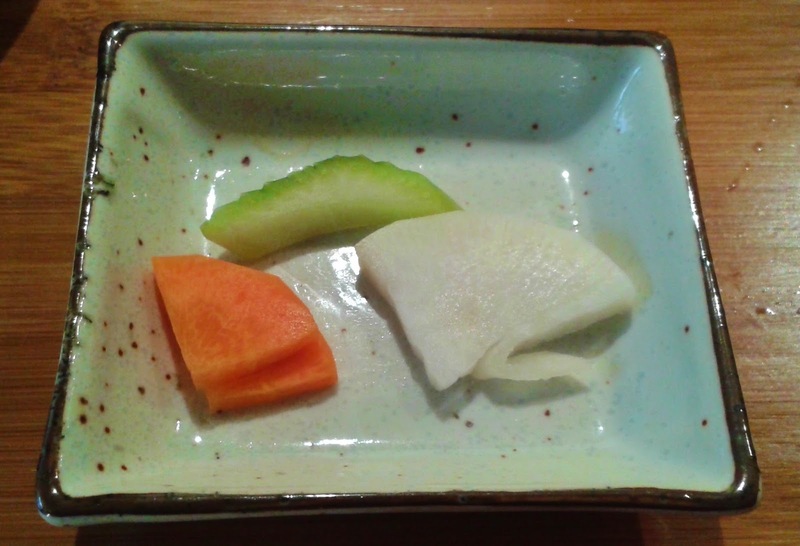 The Pickled Vegetables (described as "Pickles" on the menu) came with two small pieces each of carrot, celery and daikon (I accidentally ate a bit of it before taking a picture!). 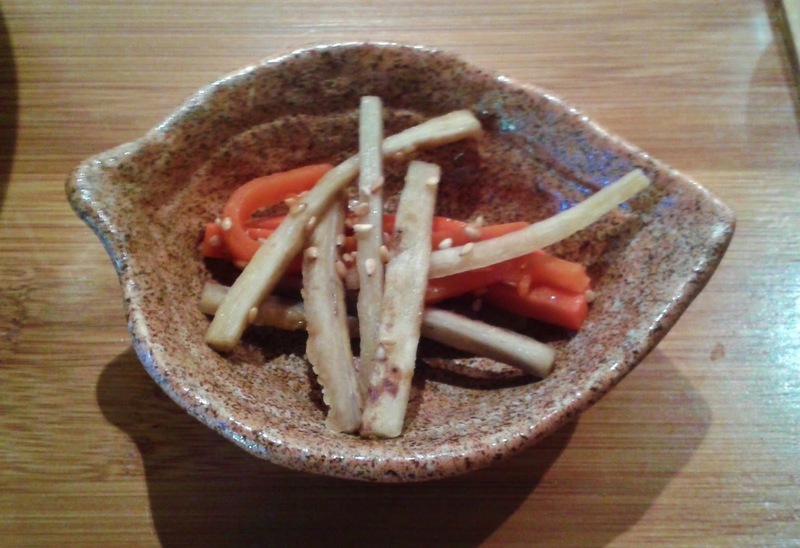 The pickled vegetables had a crunchy texture to them, and there wasn't anything remarkably special about their taste. The Tako Sunomono came with thinly sliced pieces of tako, a slice of pineapple, some extraordinarily thin slices of cucumber and some crystal vermicelli. I really liked how the tako was sliced thin, so that it was chewy but not unchewable. 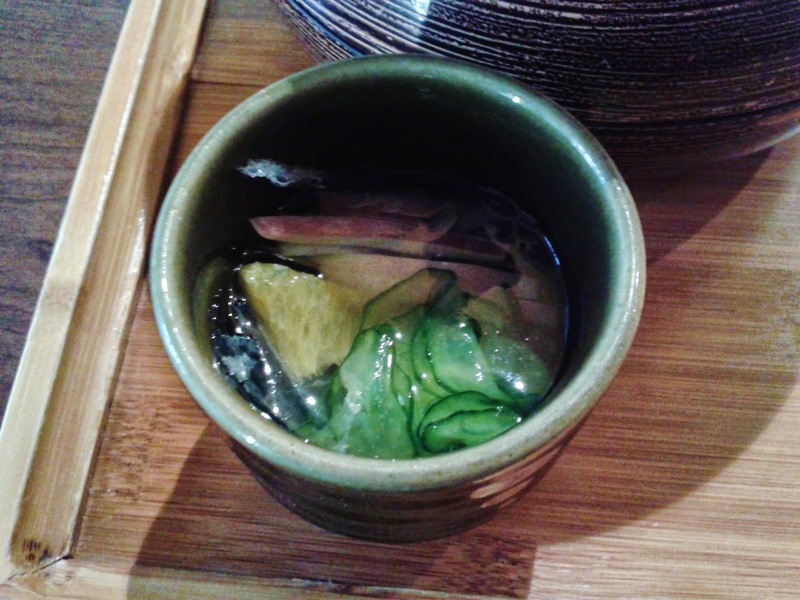 The vinegar in the sunomono was adequately strong and did not overpower any of the ingredients. The Carrots & Bamboo Shoots (not listed on the menu under the Kaiseki lunch set but included as part of the set) consisted of a few pieces of sliced carrots and bamboo shoots decorated with sesame seeds. I found these sweet and savory, and the slices were seasoned like the Chinese recipe of jellyfish. The Kakuni (Japanese braised pork) came in a small container and consisted of well-braised lean meat. It would have been nice if it was served a little warmer (it ended up being cooler than the sashimi). The Unagi and Friends (name is made up by me) came with a thin piece of unagi on fish cake, a piece of kamaboko (the pink and white piece) and tamago. 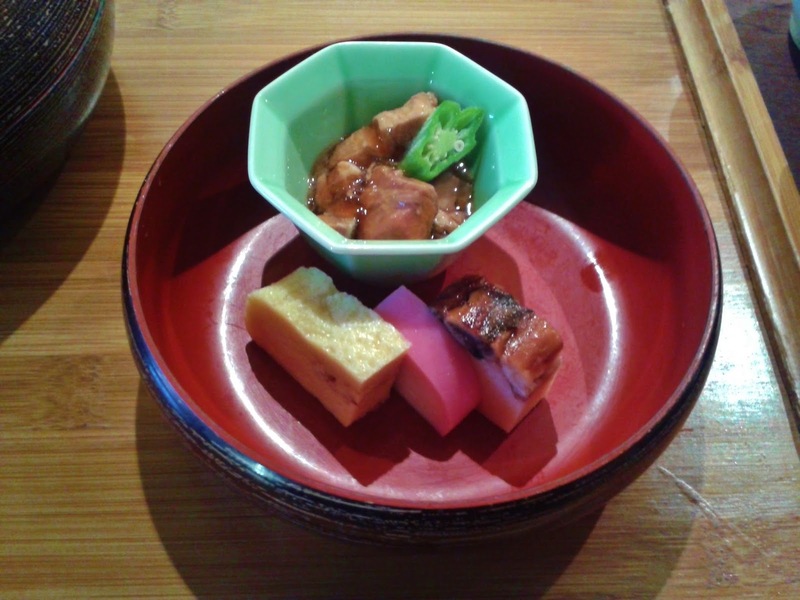 The fish cake completely overpowered the unagi, which was sliced quite thin. However, I enjoyed the very soft and chewable kamaboko and the tamago was rich in flavour, being the best out of the three. The sashimi course came with two pieces of Toro Sashimi, one piece of Sockeye Salmon Sashimi and two pieces of Tai Sashimi. The Toro Sashimi was a bit stringy, but had a nice mildly salty taste. The Sockeye Salmon Sashimi was cut so that it resembled a mini mountain range, and was a bit tough but tasted fresh. The Tai Sashimi was buttery and had a nice glossy finish. It felt like there was a dash of mayonnaise added to it, which helped to enhance its creamy flavour. The Sushi Tower came with salmon, masago, mango and avocado on rice, along with some wakame (seaweed) and ginger to the side. The Atlantic salmon had a smooth teture and was very fresh. It was the best out of all the sashimi I was served in this meal. The textures of the mango and avocado blended very well with the sashimi, so that it would all taste like a tower of distinctly sweet sashimi if you weren't looking! After I finished all of the courses on the tray, I received a Crème Brûlée for dessert (which is included as part of the Kaiseki lunch set). OMG ... I completely had a foodgasm at how immaculate this crème brûlée was in terms of both presentation and preparation! The fruits and berries were all fresh and very juicy, and went surprisingly well with the custard base. The custard itself was smooth, creamy and sweet with a rich green tea aroma. It was covered by an irresistible thin and crusty layer on top. This was hands down the best item of the entire meal. The Kaiseki lunch set was highly unique in presentation and I haven't found anything else quite like it throughout my sushi adventures all around Greater Vancouver. Almost all of the items in the lunch set show careful preparation from the lone sushi chef who made all of the sets. And I will almost certainly be back for more of that delicious crème brûlée!